Rincon sits in the Savannah metropolitan area and gives happy residents a relaxing place in which to live outside of the big city. Though this charming town has grown in recent years, it still remains a quaint suburb and a neighbor of the Savannah National Wildlife Refuge. Because of its close proximity to nature, Rincon is the target of many different pests, from tiny fleas to blood-sucking mosquitoes. Ideal Pest Control has these insects and more in our sights as we aim to protect your happy home. Fleas, no matter how many, create an annoying situation for residents in Rincon. These small pests congregate in yards across the area and bite at the ankles, feet, and legs of people in their backyards. They spring onto cats and dogs and hitch a ride indoors where they infest your living areas and lay eggs on the carpet. A flea infestation won't go away on its own, and it takes more than do-it-yourself pest control to get rid of fleas and their eggs. After all, the eggs won't hatch right away and will only lead to future infestations. Our technicians will treat the adult fleas and their eggs, eliminating both and giving you a pest-free home. 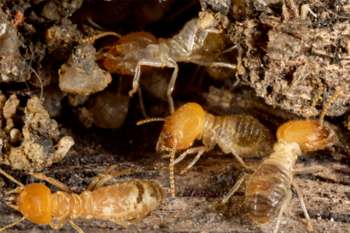 Termites live in colonies and typically remain in wooded areas where they can feed on old logs and tree limbs. However, some termites find their way onto residential and commercial properties and attack wooden structures. Because termites feed on the cellulose in the wood, they will continue to eat away at the structure until it's gone or they've been eliminated. Our professional pest control technicians can inspect your property for termite infestations, checking both the foundation and the areas above where the termites may have infiltrated. We'll treat and cure existing infestations and use preventative treatments to stop a reinfestation in the future. Mosquitoes are like flying syringes looking to stab you and to take your blood. Some mosquitoes carry diseases like the West Nile virus and transmit them to people, causing outbreaks in various parts of the world. These disease-carrying pests peak in the summer months and detect carbon dioxide from almost a mile away, making you a quick target as soon as you step outside. While it's a good idea to remove standing water from your property and to keep the grass and shrubs trimmed, you should also have a certified professional treat your property for mosquitoes. We can set up preventative treatments around the perimeter and deter these pests from invading your yard. Contact Ideal Pest Control to request an inspection and to get a free estimate on our services. Our professional team knows how to combat stubborn fleas, mosquitoes, and termites and can keep these pests and others from raiding your property and affecting your family.